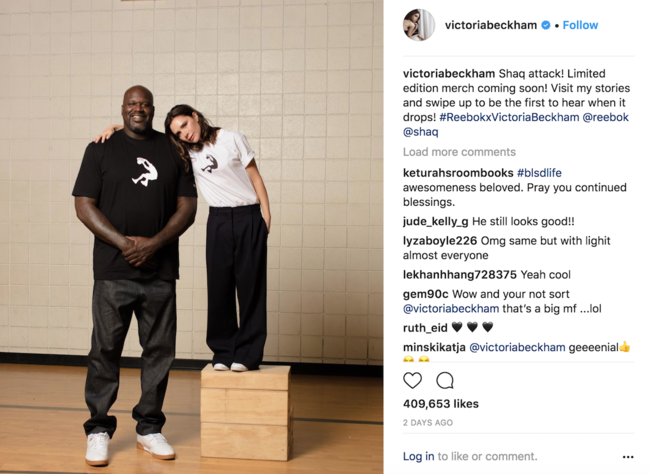 Victoria Beckham gave a sneak peek into her limited edition collection in conjunction with Reebok at an event in LA late last week, alongside Reebok brand ambassador Shaquille O’Neal, who she says inspired her designs. The line is launching as part of the Reebok’s Innovation Collective, which earlier saw a successful footwear launch in partnership with Vetements. And the publicity round for the launch has made the most of just how very different Beckham and O’Neal are. The two shared plenty of snaps on Instagram to mark the collaboration, highlighting the fact that he’s 7ft 1in and she’s only 5ft 4in. And they appeared together on James Corden’s Late Late Show wearing T-shirts printed with O’Neal's LA Lakers number, 34. Those T-shirts offered the first view of just what the collection will comprise and if they’re typical, they’ll mark a change of direction for the popstar-turned-fashion mogul. She may have evolved over the years from her early Roland Mouret-style dresses to her current, more relaxed style, but from what we've seen so far, this is the most casual look that she’s yet offered. We've also seen a hoodie on Instagram that's part of the collection, so it’s clear that the T-shirts aren’t the only casual pieces we’ll be getting when a preview of the collection launches in May, ahead of a full debut later this year. And in that respect, the combination of Beckham, Reebok, and O’Neal is a good one as all three were at the top of their game in terms of influencing pop culture during the 90s. Will the Victoria Beckham link go beyond the single collection? We don't yet know, but parent company Adidas already has a strong model for how to turn a collaboration with a female designer into a long-running success story via its Stella McCartney partnership. Watch this space.